In this document the search options concerning performance are summarized and their usage is shown in different search interfaces. Sets maxResultCount property. Limits the number of molecules returned by the search to maxResultCount. If maxResultCount is 0, then there is no limit. Default value is 0, i.e. there is no limit. JChem Oracle CartridgeUse the jc_compare operator with maxHitCount:int. Option can be set on Query>main options tab by setting value of Max. hits. 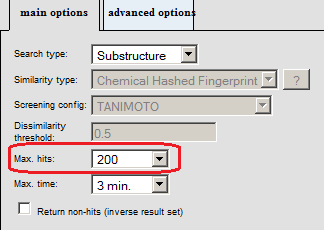 Default value is "200". Limits the time of the search. TotalSearchTimeoutLimitMilliseconds is to be specified in milliseconds. Search will be stopped after the specified time has elapsed and the hits found up to this time are returned. There is no timeout limit, by default. Use the jc_compare operator with totalSearchTimeoutLimitMilliseconds:int. Limits the time of the search. max-time is to be specified in milliseconds. Search will be stopped after the specified time has elapsed and the hits found up to this time are returned. The default value for this option is "unlimited time". 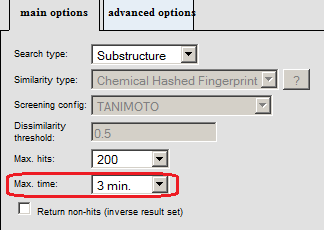 Sets option for rearranging query atoms to increase search performance. False, if search should rearrange query atoms for better search performance. Default value is false. If more than one queries are present, at least one is required to match. For DB targets, only the first query is considered. The search on a single target can reach this amount of time. Set it to -1 if you do not want the search to timeout. The timeout limit has to be set in milliseconds. Default value is 120000 (2 minutes). Upon reaching this number of steps, the search switches to exhaustive mode from fast mode. Setting to -1 means never. Default -1.